It’s mid-August and despite some surprising news coming down the pipeline yesterday, the NHL news machine is in its usual lowest of lows. This year’s free agency is a distant memory and training camps are still ways away. Now is the time fans speculate about next season. Player ‘X’ is due for a great year and player ‘Y’ is going to lead our team to the playoffs next season are just two scenarios that are echoing from fan to fan across the league. The base of many of these scenarios is the statistics that comes along with the players talked about. You can’t tell who is having a career year or down year, who will lead a team or fall down the depth chart without the basic goals, assists, points and plus/minus tied to each player. Let’s put our thinking caps on and take a shot at predicting who will lead the Kings in those major categories at the end . highs in goals, assists and points with 31, 27 and 58 respectively and with no ceiling in sight Toffoli could set new career marks during the 2016-17 season. An interesting variable moving towards next season is Toffoli’s contract status. At the end of next season, Toffoli will be a restricted free agent with Los Angeles and the winger will likely sign the dotted line on a new contract with a much larger cap hit than the $3.25 million cap hit he carries at the moment. 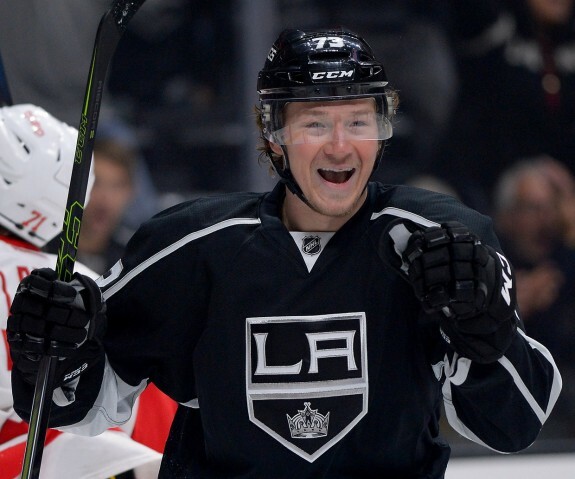 It will be interesting to see if playing for a new contract, not like Toffoli already has enough of resume to lock up a nice new paycheck, and the possible contract talks during the season could take Toffoli’s mind off the ice and hinder his production. 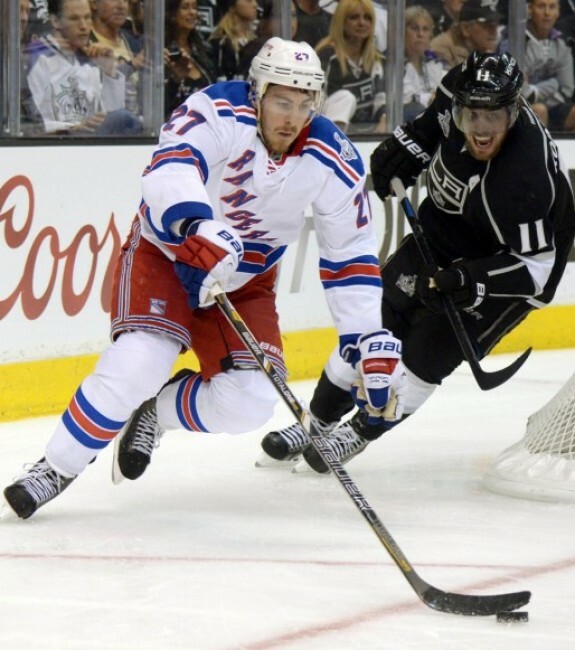 Last season, Anze Kopitar and Jeff Carter came in second and third with 25 and 24 goals respectively. Both could give Toffoli a run for his money, Carter trailed Toffoli last season by only seven goals and played in five fewer games. Kopitar is a magician with the puck, plain and simple. The Slovenian’s work in open ice, behind the net, along the sideboards with any amount of pressure is a thing of art. Just when a defender thinks they have Kopitar locked down, Kopitar finds a way to create space and move the puck, even if it’s not with his stick. After watching the above play, and glancing across any Kopitar highlight reel it shouldn’t surprise you that Kopitar led the Kings in assists last season. But looking deeper at Kopitar’s numbers shows you he isn’t getting points by poaching assists as the secondary assist on goals. The ten-year NHL veteran actually led the Kings with 25 primary assists last season. The next closest player was Milan Lucic, who is no longer with the Kings, who notched 24 and Carter trailed those two with 20 primary assists. As mentioned above, Kopitar will be without Lucic this season. The two skated alongside each other just under 30 percent of Kopitar’s even strength time on ice and were together for 25 of Kopitar’s 54 even-strength points and 11 of his 18 power-play points. But Kopitar could still be slotted with offensive weapons like Toffoli, Carter, Tanner Pearson or Marian Gaborik, which should ease the loss of Lucic and keep Kopitar atop the assists column. Since joining the Kings, Kopitar has led the Kings in points every season except for his rookie season. The 2006-07 season was the last time Kopitar didn’t finish number one points for the Kings. That season Kopitar finished behind Michael Cammalleri (80 points) and Alex Frolov (71 points) with 61 points. Since that season, Kopitar has gone nine for nine when it comes to finishing atop the Kings in points. This year will be different. Toffoli is the future in Los Angeles, and what better ceremonial passing of the torch than Kopitar handing off the team’s scoring title to the team’s young stud. Toffoli finished last season in third on the team with 58 points behind both Carter (62 points) and Kopitar (74 points), but the 24-year-old saw a nine-point increase in last season’s production and barring an unfortunate injury, his play should continue to rise as he moves into the prime of his career. Toffoli will rarely find himself on the ice without either Carter or Kopitar on the ice with him, which will only add fuel to the likely three-man race for the team’s scoring title. But Toffoli should beat out the Kings’ older talents and win one for the kinds coming up on the Kings’ roster. Last season’s race for plus/minus supremacy was a two-horse race between Kopitar and Toffoli. Real shocker there, right? As the last buzzer sounded on the season, Toffoli and Kopitar finished a plus-35 and plus-34 respectively good enough for the top two spots on both the Kings roster and in the NHL as a whole. Hockey is a simple game made complicated in many ways. In the simplest form, you have to put the puck in the other team’s net while keeping the puck out of your own at the same time. It should be no surprise the forward that won the Selke Trophy for demonstrating “the most skill defensive component of the game” will sit atop the plus/minus category next season. Kopitar contributes in every aspect of the game, he’ll score a goal or toss a nifty pass to set one up in the offensive zone while locking down his opponent’s top line for 20 minutes a night. Kopitar has found his groove as the NHL’s top two-way forward and he should dethrone Toffoli next season as the King with the best plus/minus .